Pop up stands are ideal for exhibitions and trade shows due to the portable nature of the frame and the ease of assembly. Once the frames is up, printed graphic panels are attached to the frame or if it is a fabric pop up then the one piece covering is placed over the frame, creating an attention-grabbing display. Over the years we have sold thousands of pop up displays and we know what will work best for our clients based on the size of their stand and the show they are attending. Our in-house design and print studio ensures all custom printed graphics are produced to a flawless standard, enabling your brand to stand out from the crowd. We have a huge range of pop up exhibition stands available, from classic graphic panel stands that come with a 10 year frame guarantee, to fabric popups, which are becoming an increasingly popular choice due to the portability of the graphics. 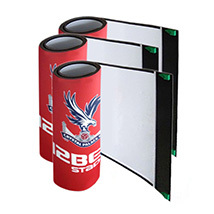 Exhibition pop up stands with printed graphics available in a range of straight or curved sizes. 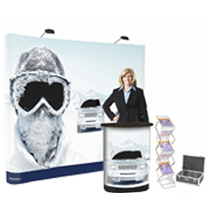 Great value pop up bundle kits with printed graphics. Everything you need for an exhibition. Lightweight fabric stands in a choice of frame styles and sizes, many with custom printed graphics. 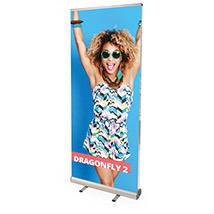 Tensioned and roller banner stands in a choice of widths and styles. Assemble in seconds. Linkable pop up systems with custom printed graphics in a range of sizes and configurations. 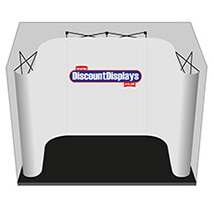 Give your pop up a makeover and save money by replacing your graphics rather than the stand. 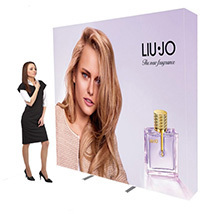 Popup display stands have been very popular at trade shows and exhibitions in the UK mainly due to their portability and ease of use, which is especially crucial when attending multiple shows a year. There is still no easier way to create a back wall for an exhibition stand or an in-store retail display. How big are pop ups? They come in a variety of sizes and are commonly called things such as 3x2 and 3x3 stands. This refers to the number of squares that make up the frame, rather than any reference to size. To find out the size of any specific stand, simply go to the relevant product page where the information will be listed. How long does it take to put up a pop up exhibition stand? As mentioned previously the frame only takes seconds to popup, but you will need to spend a few minutes adjusting each panel so you end up with a seamless graphics. Hanging the graphics is a simple process as each stand is assembled and checked for perfect graphic alignment before they are dispatched. You will also be provided with a printed visual, which are marked up with panel numbers that correspond with numbers printed on the back of each graphic. For fabric pop-ups you simply place it over the frame like a sleeve, where it is held tightly in place. What is the difference between fabric and graphic pop ups? Graphic pop ups are our most popular option and comprise of custom printed, scuff resistant laminate graphic panels. These attach to the frame easily using hooks that slot onto the frame and magnetic strips to hold the panel in place. Fast easy and simple. Fabric pop ups come with a similar frame to the graphic version, but instead of panels a one-piece fabric covering is placed over the frame. The fabric can either be custom printed with your promotional message or come with single coloured Velcro friendly panels, on which you can attach print using Velcro. The latter is a popular choice with schools. How do you attach the printed graphics? The graphics come in strips that are 675mm wide. Each strip has a header with slots that allow the graphic to be 'hung' from the frame. Down each edge of the graphic there are magnetic strips which attach to the magnetic bars on the pop up frame holding the graphic securely in place. Can they be used as a double-sided display? 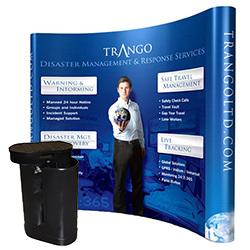 Yes, many of our stands are available with single or double-sided print. The frame is the same, but with a few more magnetic bars so that you can attach graphics to the rear and have a double-sided exhibit. No, you don't need any tools to put up our pop up stands. The concertina frames popup into position and when fully expanded click together using strong magnets. Can I display a TV on my pop up? Yes, we have stands with a TV mount attached or you can use a freestanding monitor mount that fits behind the frame. Both options are becoming increasingly popular at trade shows.